"By the Grace of God King of the Swedes, the Goths and the Wends"
"By the Grace of God King of Norway"
The House of Bernadotte, the current royal house of Sweden, has reigned since 1818. Between 1818 and 1905, it was also the royal house of Norway. Its founder, Charles XIV John of Sweden (who was born Jean Bernadotte), was adopted by Charles XIII of Sweden, whose House of Holstein-Gottorp was becoming extinct. Following the Finnish War in 1809, Sweden lost possession of Finland, which had constituted the eastern half of the Swedish realm for centuries. Resentment towards King Gustav IV Adolf precipitated a coup d'état. Gustav Adolf (and his son Gustav) was deposed and his uncle Charles XIII was elected King in his place. However, Charles XIII was 61 years old and prematurely senile. He was also childless; one child had been stillborn and another died after less than a week. It was apparent almost as soon as Charles XIII ascended the throne that the Swedish branch of the House of Holstein-Gottorp would die with him. In 1810 the Riksdag of the Estates, the Swedish parliament, elected a Danish prince, Prince Christian August of Augustenborg, as heir to the throne. He took the name Charles August, but died later that same year. At this time, Emperor Napoleon I of France controlled much of continental Europe, and some of his client kingdoms were headed by his brothers. The Riksdag decided to choose a king of whom Napoleon would approve. On 21 August 1810, the Riksdag elected Jean-Baptiste Bernadotte, a Marshal of France, as heir presumptive to the Swedish throne. 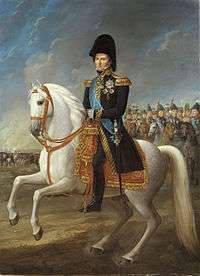 Jean Bernadotte, from 1818 to 1844, King Charles XIV. The coat of arms of the House of Bernadotte combines the coat of arms of the House of Vasa (heraldic right) and the coat of arms of Bernadotte as the Prince of Pontecorvo (heraldic left). It is visible as an inescutcheon in the Greater Coat of Arms of the Realm. Some members of the house who lost their royal status and Swedish titles due to unapproved marriages have been given the titles Prince Bernadotte and Count of Wisborg in the nobility of other countries. Bernadotte, born in the town of Pau, in the province of Béarn, France, had risen to the rank of general during the French Revolution. In 1798, he married Désirée Clary, whose sister was married to Joseph, Napoleon's elder brother. In 1804, Napoleon promoted Bernadotte to a Marshal of France. Napoleon also granted him the title "Prince of Pontecorvo". As the Crown Prince of Sweden, he assumed the name Charles John (Swedish: Karl Johan) and acted as regent for the remainder of Charles XIII's reign. In 1813, he broke with Napoleon and led Sweden into the anti-Napoleon alliance. When Norway was awarded to Sweden by the Treaty of Kiel, Norway resisted and declared independence, triggering a brief war between Sweden and Norway. The war ended when Bernadotte persuaded Norway to enter into a personal union with Sweden. Instead of being merely a Swedish province, Norway remained an independent kingdom, though sharing a common monarch and foreign policy. Bernadotte reigned as Charles XIV John of Sweden and Charles III John of Norway from 5 February 1818 until his death on 8 March 1844. The House of Bernadotte reigned in both countries until the dissolution of the union between Norway and Sweden in 1905. Prince Carl of Denmark was then elected as King Haakon VII of Norway. Carl was a grandson of King Charles XV of Sweden and a great-great-grandson of Charles XIV. King Charles John's first known paternal ancestor was Joandou du Poey, who was a shepherd. He married Germaine de Bernadotte in 1615 in the southern French city of Pau and began using her surname. Through her the couple owned a building there called de Bernadotte. A grandson of theirs, Jean Bernadotte (1649–1698), was a weaver. Another Jean Bernadotte (1683–1760), his son, was a tailor. His son Henri Bernadotte (1711–1780), father of the future Swedish–Norwegian king, was a local prosecutor, from a family of weavers and artisans, who had once been imprisoned for debt. This is a modest family which occupies only one floor of the house in a cross street in a popular and peripheral district of Pau. Two branches of the French Bernadotte family survive. The elder descends from Andrew (André) Bernadotte, an older granduncle of Carl John's, with descendants today in the general population of France. The younger branch divided in two, one branch descending from the king's older brother John (Jean Évangéliste) Bernadotte (1754–1813), the heads of which were French barons as of 1810 with Louvie Castle in the south of Pau as their seat (branch extinct with the death of Baron Henry Bernadotte in 1966), and the other branch being the Swedish Royal House. The list excludes in-laws and has persons currently alive (2015) in italics, all listed primarily as Swedish royalty unless otherwise noted. ↑ "Bernadotte : un général de Napoléon devenu du Roi de Suède" (in French). ndf.fr. ↑ "Le fabuleux destin de Jean-Baptiste Bernadotte : de Pau à Marseille" (in French). lefrancofil.com. ↑ "Victoria de Suède sur les pas de son aïeul" (in French). larepubliquedespyrenees.fr. ↑ "Photo du Château Louvie, à Jurançon - Côté Est" (in French). J. Callizo, photographe (1909). Jean-Marc Olivier, "Bernadotte Revisited, or The Complexity of a Long Reign (1810–1844)", in Nordic Historical Review, number 2, October 2006, pp. 127–137. The Bernadottes in Black and White, photos from an exhibition at the Nationalmuseum, Stockholm.